THE MIND THAT MAKES US. How the way we think affects the way we perform. What makes us human beings, distinct from all other animals that roam this Earth, are our minds. We have developed the ability to each form a distinct consciousness, capable of processing and understanding emotions, critical and abstract thought, and the development of an individual personality from both experiences and innate traits. Our minds have made us the dominant species on this Earth, but is also our minds that can hold us back the most on both a species and an individual level. Our thoughts are the driving force behind everything we do, and more often than not, we feel as though we are in control of our own. This allows us to direct our attention to a given environmental or internal stimulus. It is not wholly uncommon, though, that we may feel as though we have lost control of our own minds – we worry without end, preoccupy ourselves with the future and dwell on the past. It seems as though this is a fundamental problem in the human psyche: we possess the greatest and most complex gift imaginable, but it can become a curse when we lose control of it. Anyone who feels this way should know that they are not alone and that almost every human being can truthfully admit that they have felt out of control of their own mind at one point or another, be it for moments, weeks, or years. This lack of control can bring about a sense of helplessness, despair, or weakness, but one must always know that they have the potential and the power to overcome their mind – it is theirs, after all. One of the most effective strategies to calming the mind is to simply breathe. 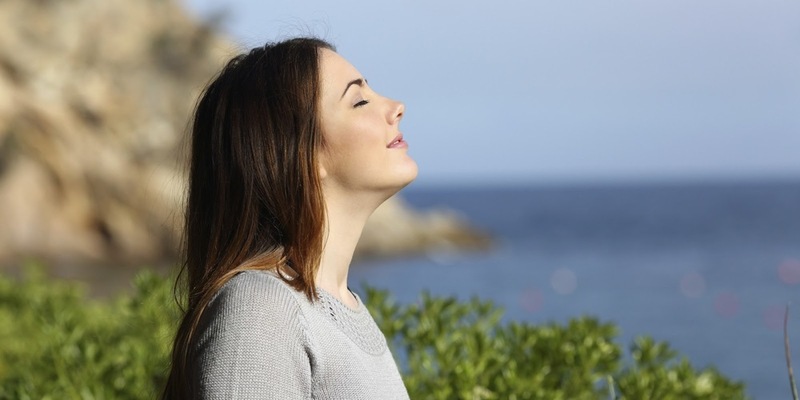 Breathing deeply stimulates blood circulation throughout the body and increases parasympathetic nervous system activity, which opposes the sympathetic division responsible for bodily arousal and stimulation. The parasympathetic division of the autonomic nervous system is responsible for “rest and digest” – calming the psyche and decreasing adrenal activity. This in turn leads to decreased levels of adrenaline and cortisol (the stress hormone) circulation. Breathing also allows one to become centered in the body and in the present moment, the here and now. Dwelling on the past and worrying for the future drags the attention of the mind away from the body and its current physical state and increases hormonal stress levels, essentially furthering the cycle of worry. Mindfulness of the present moment is the key to combating this cycle, and can be a truly influential realization, one that would be beneficial for so many who live a life plagued by constant worry, feelings of helplessness and disconnection, and mood disorders. Acceptance of the present moment is a key aspect of staying in it and in control of the mind. The analyzing and critical mind can more often than not find something less than satisfactory of it’s present situation, a driving force for returning to divert attention away from it and towards the past and future. Acceptance relieves the sense of resistance one may feel when coming into the present moment and is not limited to one’s external environment and situation, but also to emotional states and arising thoughts. Acknowledging emotional and mental states and accepting them for what they are quiets the mind’s preoccupation over them, bringing about a sense of control over the mind and the ability to fully engross oneself in the moment. Control of the mind, can and will improve one’s quality of life. Not only will it bring about a more relaxed and consistent mental state, but also increased mental clarity and the “slowing” of time. When the mind becomes preoccupied with things other than the present, the present zooms by with little regard from the mind, never fully absorbing it. One may say “The past couple of weeks have flown by”, but a person who is truly present knows that being immersed in the moment allows time to slow its pace and for the mind to fully experience the things around it. The feeling of being bogged down by negative thoughts and emotions will subside, and second-guessing will cease when one realizes that any result is one that can be accepted. Learn more about Coach Amber here!